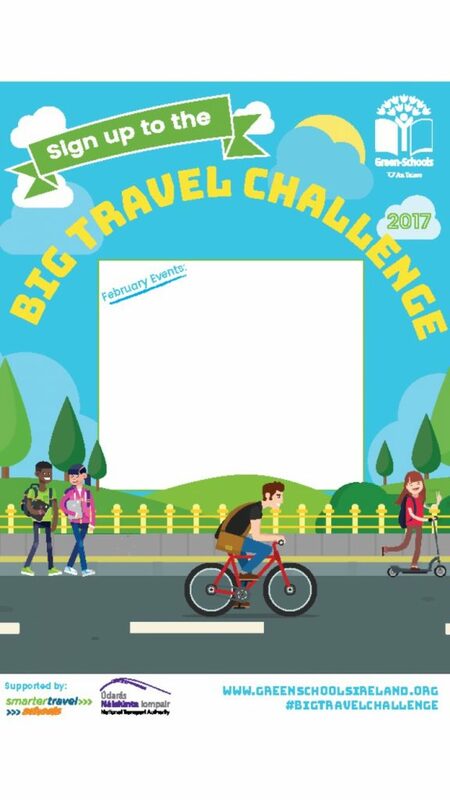 Our school will be taking part in The Big Travel Challenge. This is a nationwide competition that we will be running from the 1st – 14th of February. We are looking to increase the amount of people walking or parking ’n striding to school every morning over the two weeks. During the time we will continue to record how many children walk to school and at the end of the two weeks our results will be sent to Dublin and the winning school will be chosen. Schools will be in with a chance of winning €1,000 and there are four runners- up prizes of €500. As a parent / guardian, we really appreciate your effort and co-operation for this event. It will be different from the WOW days, there won’t be any meeting points or supervision. Every pupil in the school received a Hi-Viz jacket this year, so visibility en route should not be a problem. Please feel free to walk with your child if needed or inform your child of the safest route to take. Remember – a little less gas and fumes going into the atmosphere can make a big difference. Plus, we also get a little fresh morning air which is excellent for our health. This means we are asking that everyone parks, no closer than the car park by Motherway’s shop if approaching from that side or Traonach if approaching from that side, and walks the rest of the way to school. This will be from Monday February 13th – Wednesday February 22nd inclusive.